Sand Point, with a population of 5,725, is located in the tip of the Idaho panhandle just 60 miles from the Canadian border. 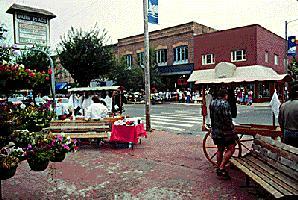 This is downtown Sand Point during the annual "Crazy Days" summer street sale. Looks like fun! Sand Point is nestled on the northwest shore of 43-mile-long Lake Pend Oreille, (pronounced Pen-der-ray) at an elevation of 2,070 feet. 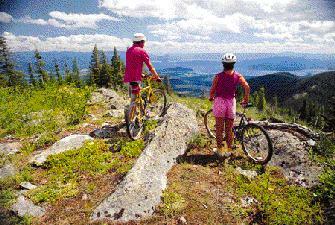 It is surrounded by the Selkirk and Cabinet Mountains which are part of the frontal ranges of the Rockies. 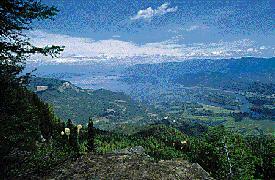 Lake Pend Oreille has 111 miles of shoreline, making it the fifth largest lake in the western United States. 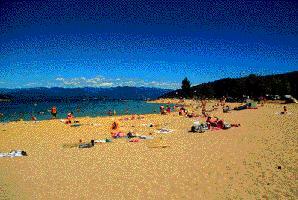 During the short summers, folks enjoy the sunny, blue skies at Sand Point's City Beach. 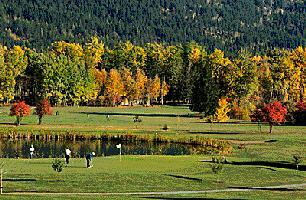 A lovely fall scene at beautiful Hidden Lakes Golf course. 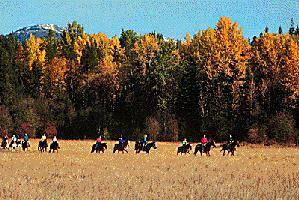 Anyone for a horseback ride through Selle Valley? This ice sculpture was part of the Arctic Blast Festival. Plenty of lights decorate Sand Point during the holiday season. As we leave Sand Point, we can see the sun setting on Lake Pend Oreille. 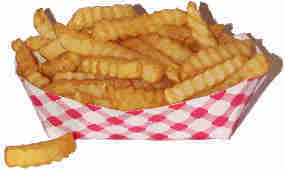 Joe, we need the french fries to get to the next page. I promise we'll give them back as soon as we get there.